Morning Fluffers! Isn't it a gorgeous day again? I've been wanting to try colouring on Kraft for a little while, but nerves have stopped me. Loaded up with a mahoosive mug of tea and a little (ahem!) pile of choklit buttons, I bit the bullet and had a go. What else is new? Pictures. I've been a bit naffed off with the way my photo's have been looking of late. so armed with the Macro Setting, and a new, large, white slice of card, I've been on the floor, doing deliberately 'arty' shots, instead of frustrating I look like I've been on the booze all day wonky ones! Result, better, I think? I am going to enter this first card at Sketch Saturday as I've used the fab sketch and also MMCS, which is Anything Goes. While I was making the first card, I was dithering about what stash and papers to use. In the end there was so much stuff on the desk, I had enough to make two cards, along the the same but different route. And I really enjoyed it. I'll enter this one at MMCS too. 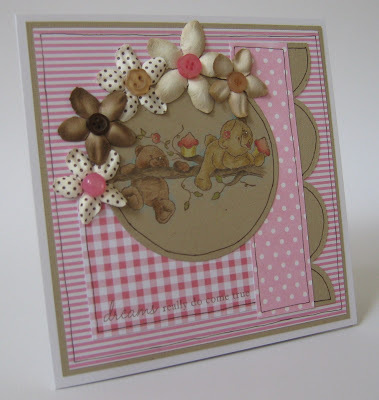 This is so cute Faye :) What a gorgeous image, and I just love the soft colours. The pearls and the buttons are so pretty. wow Faye...2 fab cards!! I must check out the macro thing as your photo are fab too!! Well done you! 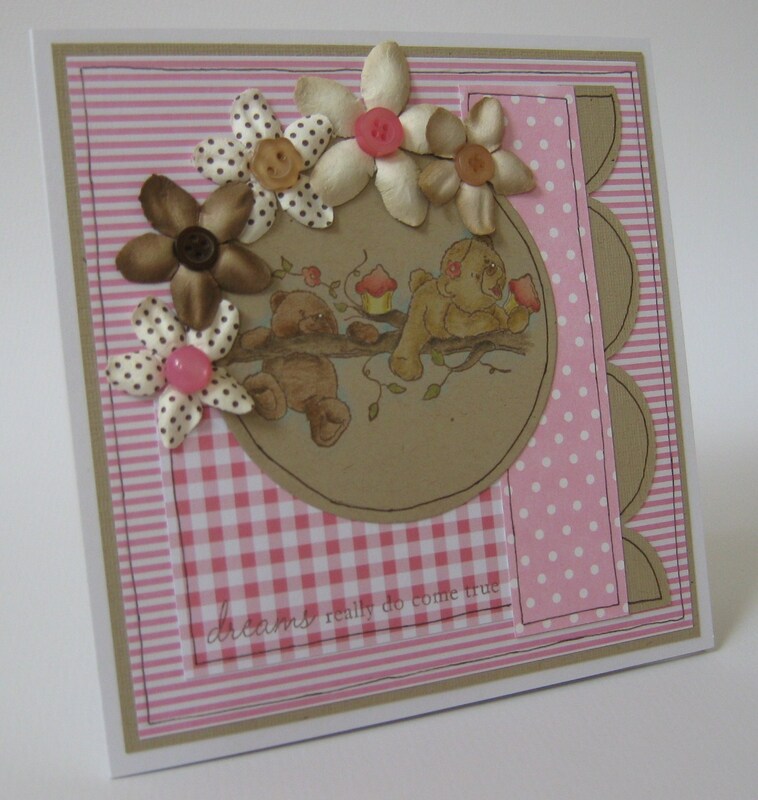 I have had several attempts at colouring on Kraft and it never makes it onto the blog. Yours is fab! I must ask, what is a Polychromo pencil? It sounds kind of biological/petri dish/ivf related rather than a piece of crafty parafinalia! Right must get out into the sun before it disappears! Both these cards are gorgeous. I love choccy buttons by the way!! Gorgeous cards, amazing colouring and beautiful photos, very arty :) What more is there to say, other than i wish my 3 would have an afternoon nap so I could create (rather than do housework!) Oh and there are no better buttons than chocolate ones!!! Both cards are adorable! Great job with the kraft. I have not attempted it I still have trouble coloring on plain paper. It is like why learn another language when I have trouble with English! The choklit & tea worked, because they are great cards. Love the papers! They are both gorgeous card Faye. I've bought some kraft, just not plucked up the courage to give it a go. Fab results! wow, you managed to create 2 cards....and I love them both....such a cute image! WOW, what wonderful cards. It never occured to me to color on craft paper. After seeing yours, I am going to have to try it. WOWZERS these are just gorgeous!!! Love your colouring and design. Love this colouring on craft ! This is super cute! I need to have a go at doing the whole colouring on kraft card.. yours looks fab hun! 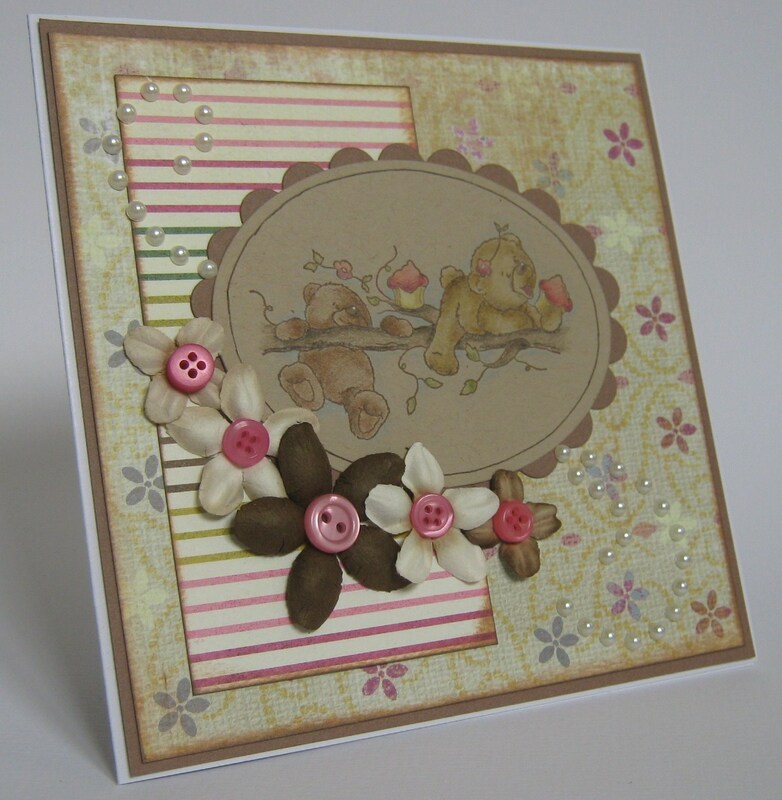 Love your cute card and love the colouring on the Kraft card. I love your use of Kraft cardstock with the colorful papers. Brilliant! Thanks for joining us at Sketch Saturday! We hope you'll play with us again soon!